A microwave method to measure moisture in encapsulant resin of IC packages was demonstrated. A network analyzer was used to generate a continuous microwave signal fed to an open-ended coaxial line sensor and measure the amplitude of effective reflection coefficient at the sensor aperture. The coaxial line sensor acted both as a source and receiver of microwave signal, which was transmitted into the encapsulant resin and reflected at the surface of a metallic plate placed behind the resin. To evaluate the moisture of encapsulant resin, fundamental experiment was carried out for epoxy resin samples with different moisture contents introduced with various environmental conditions. The relationship between the amplitude of effective reflection coefficient and the moisture content of the encapsulant resin was found, and the evaluation equation was built. The present technique indicates a possibility to determine the moisture directly without drying and weighing the sample. With the development of IC technology, the size of IC chip has been enlarged to raise the level of integration and, simultaneously, the package has been made thinner and smaller to increase the density of surface mount. Therefore, during the soldering process, as the package is exposed to the solder melting temperature, the stress that arises from the thermal expansion mismatch and the pressure induced by the evaporation of the moisture absorbed in the package sometimes cause it to crack, as shown in Fig. 1. 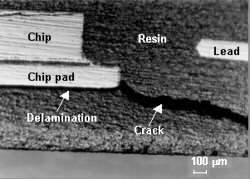 It has been reported that the package cracking initiates from the delamination, which mostly takes place at the interface between the chip pad and the epoxy resin . Also, moisture diffusion in IC packages will lead to their failure due to corrosion. Therefore, it is important to understand the contribution of moisture content to the delamination of IC packages and, the diffusion behavior of moisture in the encapsulant resin. For example, the moisture absorption in the molding compound was studied at various environmental conditions . Concerning the study of moisture contained in the encapsulant resin that affects the reliability of IC packages, the basic issue is the measurement of the moisture content in encapsulant resin. In the present paper, a new microwave method to measure the moisture absorbed in encapsulant resin is studied. Most standard methods of determining moisture content require weighing a sample, in some cases drying it for several days (up to several weeks), and reweighing. The primary advantage of microwave method over the standard weighing method is that the moisture content can be determined directly from a wet material without drying and weighing it . Microwave has been used to determine the moisture content of grains . However, conventional microwave moisture measurement cannot be used for IC packages due to lower spatial resolution. Recently, the authors have developed a microwave imaging technique by using an open-ended coaxial line sensor to detect the delamination in IC packages . The sensor same as the above is used in the present experiment. It can effectively transmit and receive microwave with a relatively high spatial resolution. that is, as the ratio of the weight of the contained water per unit volume, mw , to the total weight of wet material, where md is the weight of dry material per unit volume. The principle of the technique described here is based on the interaction of microwave signal with the encapsulant resin. An open-ended coaxial line sensor is used as a source and receiver of the microwave signal that is transmitted into the resin, and reflected at the surface of the metallic placed behind the resin. The amplitude of effective reflection coefficient in decibel, A, is associated with the permittivity, the thickness of the resin and the operating frequency. The permittivity of wet resin can be considered as a resultant of those of water and dry resin. Since the permittivity of water is significantly larger than that of dry resin, the change in moisture absorbed in the resin will lead to the change in permittivity of wet resin. Therefore, when the thickness of the resin and the operating frequency are fixed, the amplitude of effective reflection coefficient is only a function of the moisture of the resin. The configuration of the microwave measurement system is shown in Fig. 2. A network analyzer (HP8510) was used to generate a continuous wave signal fed to the coaxial line sensor and measure the amplitude of effective reflection coefficient at the sensor aperture. As shown in Fig. 3, the sensor has an inner and outer radii, a=0.46 and b=1.50 mm, respectively. It was terminated into a flat metallic flange with radius c=14.50 mm. A computer was employed to record the data output from the network analyzer and synchronize the stage translation in the x-, y- and z-directions. Encapsulant resin samples were formed by filling silica powder in 83 wt%. The dimensions of the sample are shown in Fig. 4. The moisture was introduced with the environmental conditions of 358K, 85RH% for 48 to 168 hours. The moisture contents were measured using the standard weighing method in advance. Dry sample was treated in 375K for 24 hours. For eliminating the thermal influence induced by the process of moisture absorption, microwave measurement was carried out after the sample had been exposed to the ambient for 90 minutes. In the experiment, the coaxial line sensor was contacted with the surface of the sample. To increase measurement sensitivity, the frequency was swept from 45 MHz to 20 GHz for finding the resonance frequency. By using Eq. (2), once the amplitude of effective reflection coefficient is measured, the moisture contained in the encapsulant resin can be evaluated. It is noted that, for other encapsulant resins, once an evaluation equation is made as demonstrated in the present paper, it is also possible to determine the moisture directly by using microwaves. The method to determine the moisture in encapsulant resin by using microwaves was demonstrated. The relationship between the amplitude of effective reflection coefficient and the content of moisture contained in the encapsulant resin was found to be linear. By using the evaluation equation, it is possible to determine the moisture content directly without drying and weighing the sample. Therefore, the technique may be used in an on-line environment. The authors would like to thank Mr. K. Oota of Sumitomo Bakelite Co., Ltd. for preparing the samples. This work was partly supported by: The Ministry of Education, Science, Sports and Culture under Grant-in-Aid for Encouragement of Young Scientists (A) 12750065 and Scientific Research (B)(2) 11555025; COE Research 11CE2003. H. Lee and Y. Y. Earmme, "A Fracture Mechanics Analysis of the Effects of Material Properties and Geometries of Components on Various Types of Package Cracks", IEEE Transactions on Components, Packaging, and Manufacturing Technology-Part A, Vol. 19, 1996, 168-178. S. Yi and G. H. Neo, "Hygrothermo-mechanical Behavior of Mold Compound Materials at Elevated Environment", Proc. Workshop on Mechanical Reliability of Polymeric Materials & Plastic Packages of IC Devices, ASME, Paris, EEP-Vol. 25, 1998, 271-275. Y. Ju, M. Saka and H. Abé, "A Method of the Measurement of Moisture in IC Packages Using Microwaves", Proc. the 1st International Workshop on Electronics Materials and Packaging, Singapore, 1999, 182-187. R. J. King, K. V. King and K. Woo, "Microwave Moisture Measurement of Grains", IEEE Transactions on Instrumentation and Measurement, Vol. 41, 1992, 111-115. Y. Ju, M. Saka and H. Abé, "Microwave Imaging for the Integrity Assessment of IC Package", Advances in Electronic Packaging 1999, ASME, Hawaii, EEP-Vol. 26-1, 1999, 847-853.